Emergencies of any kind are painful, stressful, and scary by their very definitions, but a dental emergency can cause even greater anxiety. Many people aren’t sure what to do when a dental emergency strikes. Do you go to an emergency room or call for an ambulance? At La Plata Dental, we are always here to help whenever our patients need us. That includes emergencies! We are able to provide same day appointments in most cases, and one of our knowledgeable team members will walk you through at-home care over the phone. 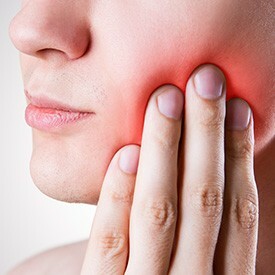 Contact us right away if you experience a dental emergency. Keep the area clean to avoid infection, but don’t rub damaged soft tissue or brush teeth that have been injured. Simply rinse any damaged areas with cool water to remove foreign matter. If you have a soft tissue injury that is bleeding, apply pressure by pressing a clean cloth or piece of gauze against the damaged area. Use ice packs at 20 minute intervals to stop bleeding, relieve pain, and reduce inflammation. Take over the counter pain relievers as directed to improve comfort, but do not put an aspirin directly onto the injured area. This will not help your tooth and may actually harm soft tissue. If large pieces of your tooth or a whole tooth are knocked out, try to replace them in the vacated socket and hold them in place by biting down on gauze or clean cloth. If you aren’t able to replace the tooth or section of tooth, store it in a glass of milk or cold water and call the office immediately.